Smarter Futures is a partnership that provides technical support and training for flour millers, government food control staff, and other stakeholders in Africa with regard to fortification of wheat and maize flour, and more recently rice, with vitamins and minerals. Adding vitamins and minerals to cereals is economically viable and cost effective. Improving the nutritional value of people’s diets through flour and food fortification will improve people’s health and well-being and lead to smarter futures. We all work toward preventing problems caused by vitamin and mineral deficiencies, such as neural tube birth defects, impaired learning capacity and decreased productivity. 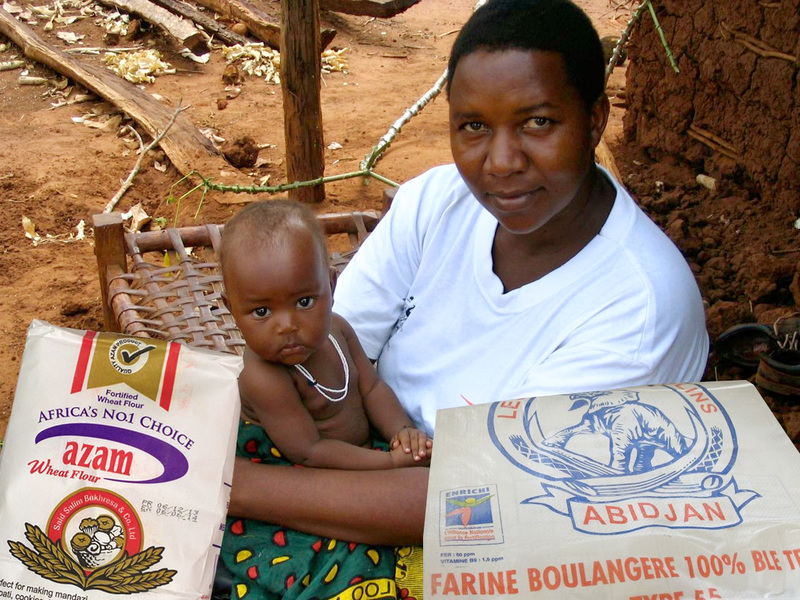 Flour fortification is one strategy for addressing such deficiencies because it delivers essential nutrients through staple foods. It does not require consumers to change their eating or buying habits. The key groups to benefit are women of childbearing age, adolescents (especially girls) and young children. Additional nutrients, especially iron and folic acid, make these group in particular smarter, stronger, and healthier. The Food Fortification Initiative (FFI, formerly the Flour Fortification Initiative), the umbrella partner. Its mission is to advocate for and support fortification of industrially milled cereal grains by collaborating with multi-sector partners. Currently 81 countries require fortification of at least wheat flour, maize flour, and/or rice. The International Federation for Spina Bifida and Hydrocephalus (IF), is driven by its mission to decrease the birth prevalence of spina bifida and hydrocephalus through primary prevention measures and to improve the quality of life for those living with these disabilities. The Global Alliance for Improved Nutrition (GAIN) was launched at the UN in 2002 to tackle the human suffering caused by malnutrition. Working with partners, GAIN aims to make healthier food choices more affordable, more available, and more desirable. We aim to support and advise governments, businesses, and development partners as they build and mobilise food and nutrition plans to advance nutrition outcomes. GAIN’s purpose is to improve nutrition outcomes by improving the consumption of nutritious and safe food for all people, especially the most vulnerable. Nouryon, a world leader in the production of food grade sodium ironEDTA, the iron compound recommended as the most bioavailable option for whole wheat flours. Nouryon participates in Smarter Futures through in cash and in kind contributions, which include a new rapid test for ironEDTA in flour. Helen Keller International (HKI), is recognized worldwide as an NGO that combats the causes and consequences of blindness and malnutrition by establishing programs based on evidence and research in vision, health and nutrition. Mühlenchemie, a member of the Stern-Wywiol Gruppe, is a global leader in flour fortification with long-standing experience in the milling industry. Mühlenchemie offers its technical know-how and strong industry network to support the ambitious goal of Smarter Futures. Founded in 1992, Nutrition International is a global organization dedicated to delivering proven nutrition interventions to those who need them most. Working in partnership with countries, donors and implementers, our experts conduct cutting-edge nutrition research, support critical policy formulation, and integrate nutrition into broader development programs. In more than 60 countries, primarily in Asia and Africa, Nutrition International nourishes people to nourish life. Bühler is a family owned Swiss Company with a leading market position globally in Grain, Food and Non-Food processing solutions with extensive application expertise. Bühler provides Flour and Rice Fortification Solutions to their customers in the wheat, maize and rice processing industry with most innovative state of the art technologies and nutritional expertise together with partners. Fortification Solutions to prevent malnutrition and under-nourishment globally fits perfectly to Bühler’s vision – Innovations for a better world!. The Ministry of Foreign Affairs of the Netherlands has awarded financial support for Smarter Futures through the year 2021. This grant is administered as part of a larger award given to the Global Alliance for Improved Nutrition (GAIN), whereby Smarter Futures is a separate, independent work stream from the larger award. Since its launch in 2009 Smarter Futures has developed well-established network connections with all relevant partners in the fortification arena, including many organisations and companies that actively support Smarter Futures technically and sometimes financially.